Whether you need cooktop repair or any appliance repair in Coconut Creek, FL, dial (954) 800-5351 for the technicians of A Plus Appliance & A C Repair Service. In addition to residential or commercial air conditioning services, we handle repairs for all kitchen and home appliances. A family-owned and operated company, we have been providing exceptional repair work for over 22 years. Properly functioning appliances can help your home run more smoothly. When one of your home or kitchen appliances fails, call us for fast and efficient service. We can make sure your laundry gets done on time with our gas and electric washer or dryer repair service. 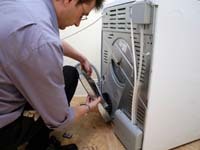 We are also the industry leaders in kitchen appliance service, maintenance and repairs. Make sure the dishes are cleaned and sanitized with our dishwasher repair services. We can also eliminate the risk of spoiled food with reliable refrigerator or freezer repair. The professionals of A Plus Appliance are the ones you can count on for your garbage disposal repair and repairs to your microwave or water treatment equipment. Get manufacturer recommended parts and expert appliance repair in Coconut Creek, FL, and dial (954) 800-5351 for A Plus Appliance & A C Repair Service today. We will be glad to provide you with a free, competitive estimate. No Service Charge if Work Is Performed and we offer senior citizen discount as well.